Egyptians go to the polls on 7 September in round one of the country's first ever multi-candidate presidential election. Despite competition from nine rivals, veteran incumbent Hosni Mubarak is expected to win. Bowing to domestic and international pressure to democratise, the Egyptian government has amended the constitution to allow more than one candidate to stand. by parliament and approved in a referendum. 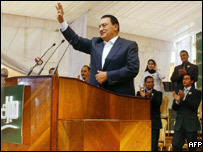 As parliament was dominated by Mr Mubarak's governing National Democratic Party (NDP), he was always the single candidate. Official figures - the last referendum in 1999 gave him 93.79% support - have been challenged by the opposition and international observers. Presidents are elected for six years with no limit on the number of consecutive terms. Mr Mubarak is standing for a fifth time. If no candidate polls over 50%, the two with the highest number of votes proceed to round two. Round two, if required, is scheduled for 17 September. Egyptians over 18 are required to vote by law. There are over 32m registered voters in Egypt out of a population of some 74.9m, according to UN figures. Each licensed political party has the right to nominate one candidate from its most senior leadership for this presidential election. From 2011, only parties established for over five years, with at least 5% of seats in parliament, can field a candidate. Independent candidates must be endorsed by 250 elected members of Egypt's representative bodies: parliament, or the local and provincial councils. As these bodies are dominated by the governing party, independents are likely to find it hard to win approval. Religious parties are banned from direct political activity. The Presidential Election Commission, composed mainly of judges, has the final say on who can stand. It has powers to oversee the election campaign and funding. And it monitors the vote itself. Despite calls from the US, international observers have not been invited as the government says this would violate national sovereignty. An independent Egyptian organisation known as "Shayfinku", or "We are watching you", has also announced its intention to monitor the poll. Officially known as the Popular Movement for Election Monitoring, it started life with just 12 human rights activists but soon claimed over 250 members. The group, headed by Ghada al-Shahbandar, has described itself as a "national movement", free from party politics and outside funding. It also rejects foreign observers. Campaigning runs from 17 August to 4 September, though unofficially candidates began canvassing support before then. Election law restricts campaign financing. But it also entitles each candidate to government aid, this time set at 500,000 Egyptian pounds or some $86,000. Many candidates, including the president, have turned the offer down. The publication of opinion polls is forbidden in the seven days before the election.